You lock eyes with Todd from accounting. Between the two of you is the last cruller, it glistens with a sugary glaze. Your fingers point forward and you raise your thumb. A moment passes. Todd reaches for the cruller. You drop your thumb and he’s blasted across the room. You blow smoke from the tip of your finger. It didn’t have to end this way, Todd. We could’ve shared that cruller. You take a bite. Delicious. 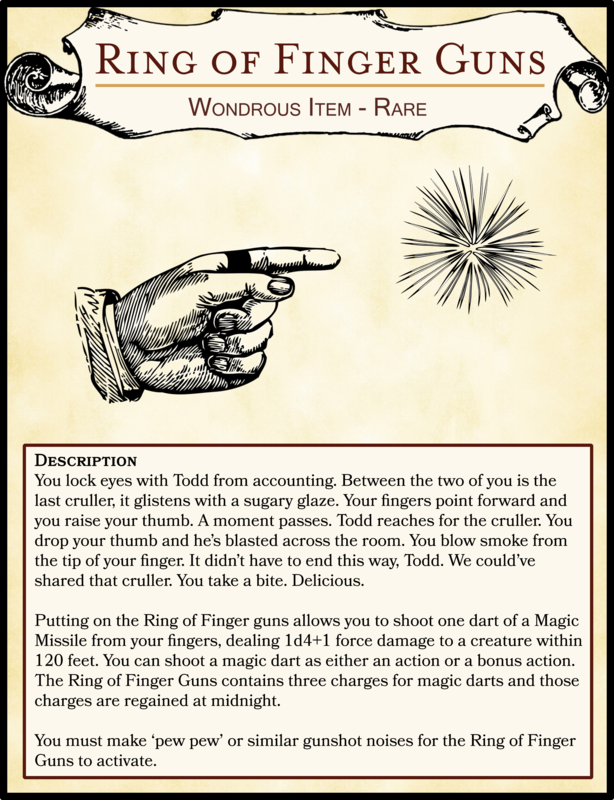 Putting on the Ring of Finger guns allows you to shoot one dart of a Magic Missile from your fingers, dealing 1d4+1 force damage to a creature within 120 feet. You can shoot a magic dart as either an action or a bonus action. The Ring of Finger Guns contains three charges for magic darts and those charges are regained at midnight. You must make ‘pew pew’ or similar gunshot noises for the Ring of Finger Guns to activate.